This weekend i went to the “Scotlands Finest” card promoted by Cyclone in Glasgow , a card where the main event had been changed as Josh Taylor’s original opponent Humberto Soto pulled out due to a cut picked up in training and was replaced by Winston Campos . From the off I wasn’t to excited by the main event , i thought Soto might have gave Taylor some rounds but there would only be one winner so when Campos stepped in at short notice i was far from excited . There was of course a good strong undercard of Scottish talent which for me was smart promoting from Cyclone and ultimately saved the show . Before this fight i had predicted this would be fight of the night and i wasn’t wrong . Right from the off this fight caught fire both men willing to trade . I thought before this fight that with Easton being the bigger of the two he would come in and look to keep Foot at bay with the jab but it became clear that would not be the case . Foot had Easton on the floor in the second as the Edinburgh man struggled to keep Foot off of him . Easton done well to recover and get back in the fight , both men landing big shots but you always felt Foot was just always getting the better of the exchanges . Foot did look to be tiring toward coming up to the stretch but it was also clear to see Jason Easton was feeling the pace . Easton came close to sending Foot to the canvas in the tenth round but Foot done well to survive . Into the Eleventh it was clear to see that both men were feeling the pace , but it was Foot who managed to find that bit extra to finish the fight . All night Foot couldn’t miss when throwing over the top of Easton’s jab and to be honest Easton deserves so much credit for staying in there as long as he did but the straw that broke the camels back came when Foot had Easton got Jason the ropes and started to unload . 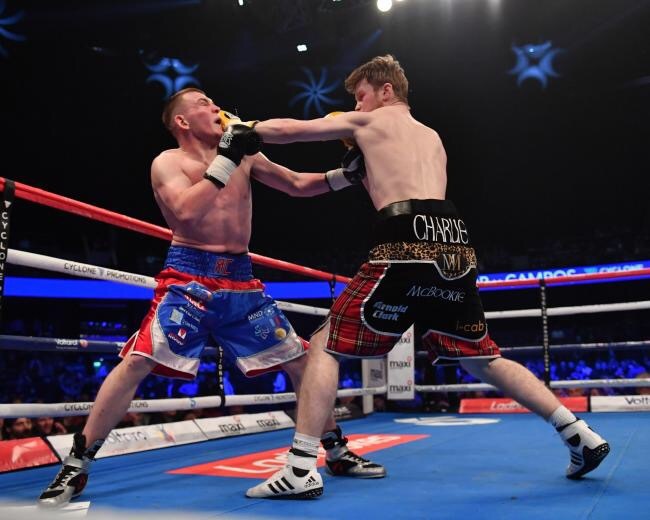 The Edinburgh man tried in vein to get up only to collapse back to the canvas , which did have me worried watching on as this fight was brutal at times . This was great fight to watch , all action from start to finish and yes the right man won . Glenn Foot went into the ring as underdog and showed why he must be taken seriously after a career best performance and really impressed as for Jason Easton he has to look at this L as a good thing . Maybe Easton has been pushed on a little to quickly and need’s to step back down a level and perfect his boxing skills . There is no doubt Easton is a talented kid but with mastered fundamentals like a good jab to keep opponents on the outside and a tight guard he will have all the ingredients to come back and beat Foot . This fight had built up so much excitement in the build up as the last time both men met it went down as a technical draw due to cuts caused by a clash of heads . Both fighters had brought in a decent amount of fans the atmosphere was superb for this one . From the opening bell Flynn looked to have stepped up a level since the last time i seen him , with his quick hands and pressure tactics he was using he was making Collins look out of his depth . That showed when before the first round had ended Collins was down on the floor after Flynn had timers him coming in and landed a beautiful combination square on his chin . Flynn looked in no mood to be messing around which seen Collins looked to hold on whenever he could . This fight looked to be one winner when a cruel twist of fate took victory away from Flynn . In the fourth round Collins was having a little bit more success but all the best work was coming from Flynn then it happened , it was like a De Ja Vu moment when both heads came together opening up cuts on both men , the worst of the cuts being right above Charlie Flynn’s eye . The referee had no choice but to call a halt to proceedings which meant the fight ended n a technical draw , which meant you had to feel sorry for Flynn who was cruising . This is the second time this fight has needed in this way but after seeing that i dont know if i would like to see part three . Colin’s looked out of his depth at times but you have to give him credit for the way he survived in there for a very tough four rounds for him . This is the fourth time i have seen Charlie Flynn and this was by far the best version of him i have seen . I don’t think there is much point in Flynn hanging around to fight Collins a third time , he is ready to push on a level . As i said at the start i wasn’t to excited by this fight as i knew it wasn’t going to last long . Josh Taylor is one of the best body punchers in boxing today and from the off Campos found out why . Compose did try to trade but that just played into Taylor’s hands letting the Scotsman go to work on him at will everytime he threw a punch . It was clear from early on that Campos didn’t have an answer anytime Taylor came inside landing big hooks throughout the first round . Taylor really came out and showed his class in the second round landing superb shots to the head and body . 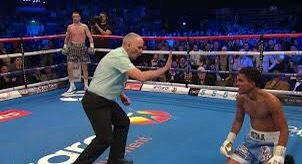 Campos can feel aggrieved when Taylor put Campos down it looked to be a punch on the back of the head but there was no question about the second knockdown after Taylor landed a lovely left hand . This fight was all but finished going into the third and after a bit of a bizarre knock down when campos went down due to Taylor’s footwork rather than a punch and that was enough for Victor Laughlin who called the fight off and rightly as Campos was well out of his league . Josh Taylor really is a pleasure to watch but this guy need to be pushed on , he is at world level so he need to fight world level oponents . This weekend Regis Prograis will fight Indongo for the WBC Intrim title and when i spoke to Prograis he was open to a fight with Taylor , hopefully this will be the level opponent Taylor will be fighting by the end of the year . First of all i would like to acknowledge the SSE Hydro security who were a match for any airport security in the world ,m even searching wallets for drugs which i thought was superb , also any trouble i did see they had it under control within a minute . There was a strange atmosphere in the arena that felt like it could ignite at any moment . It seems the boozed up , coked up element is here to stay then throw into the mix there was fans from across Scotland which can create “clan mentality” but overall the crowd were well behaved . The SSE Hydro is a fantastic arena for boxing and i would recommend attending a show there to anyone , it is one of my favourite venues .